I remember when the purple bomb hit. It was MTV, 1983. Prince's "1999" video flashed onto the screen. Swirling spotlights. A solitary figure standing atop a tiered stage. Then, drums. Wendy and Lisa. Synchronized swaying and side-stepping. A purple bass. Dr. Fink, a guy in medical scrubs, on keys. Guitarist Dez Dickerson rocking guitar and a white Rising Sun headband. 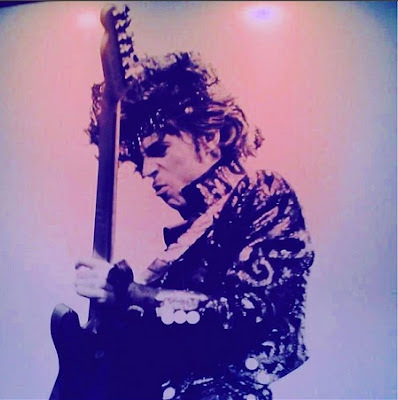 After sliding down a pole and hopping down to normal stage level, shiny trench coat flaring like a superhero's cape, Prince bounded into my life: "The sky was all purple, there were people runnin' everywhere..."
For me, the tectonic plates of popular music immediately shifted. Spinning around, grabbing the mic like he meant business, Prince was an alien, illuminating the television as if he'd been beamed down from Parliament-Funkadelic's Mothership. Little Richard hair. Impeccable wardrobe. Mustache. Dance moves like the baddest MF ever. No, this wasn't Adam Ant, Flock of Seagulls, or Men at Work, or any other staple of that fascinating early MTV era. This was a shimmering vision in purple, a renegade of funk, a charisma case in ascension. Prince Rogers Nelson was a man with intelligence and savvy—a musical genius and preternaturally gifted performer who knew what he wanted, and where he was going. Rock stars rarely arrive with so many goods: songwriting, producing, singing, playing every instrument. Almost nothing compares to his rise, artistry, and game-changing cultural impact. He had a lion in his pocket, and baby, it was ready 2 roar. When "1999" splashed onto MTV, Prince was five provocative albums deep, but the clip was a key breakthrough—a quantum leap. Gliding in next on the wings of a slow synth line was "Little Red Corvette," and it was off to the races. If you've read this far (and hey, thanks), there's no need to list all that came next, the collaborations, the accomplishments across the decades. A revolutionary intent on freedom from the outset, Prince redefined the music industry and fought many a righteous battle against it. He defied societal norms, was a guitar wizard, and won some of the deepest respect a musician can have. On a near-universal level, merely saying his name elicited reverence, a sort of unspoken, "Whoa, yeah. That guy. Astonishing." I feel wildly fortunate to have witnessed it, to have lived at the same time. Still, Prince never seemed quite real. His well-cultivated mystique supported the idea that he truly existed in another dimension. But he did walk among us. Around the turn of the millennium, I went to the NAMM (National Association of Music Merchants) trade show at the L.A. Convention Center. While perusing an exhibit, I looked up and noticed a strange trio going by. One was a woman dressed up in a traditional taxi driver's uniform, with a cap labeled "TAXI". To her right was maybe a 10-year-old child, comically wearing an identical taxi driver getup. The other person on her left, to my disbelief, was... Prince. I quickly realized the woman was a bodyguard, and the kid, well, who knows? It was a bizarre posse. Prince floated down the aisle, turned a corner, and he was gone. Farewell, Prince. No one in the whole universe will ever compare.